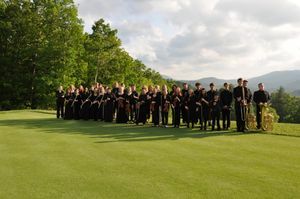 The Hendersonville Symphony offers a full progression of education programs for area youth, from introductory concerts through to advanced ensemble and performance opportunities. Annually, the Symphony presents Education Concerts for all area 3rd and 6th Grade students, introducing over 2,000 students to symphonic music each year. The Hendersonville Symphony Youth Orchestra and the Hendersonville Symphony Children’s Choir serve students per year ages 6 through 21 in a progressive curriculum of ensemble coaching and performance. Visit the education programs section of this site to learn more about our many other education programs, including the Young Artist Competition, our Scholarship program, and more. If you would like your contribution to support a specific program, please select from the drop-down menu above. If you would like your contribution to support our general operations and support of all education initiatives, please select "All Education Programs." Thank you for your contribution!